Blue Haven has been a trusted and respected North Las Vegas pool builder providing inground pools throughout the area since the Eighties. Even our design center has been in the same location for the last 25 years. Remember the Recession that hit the whole country in 2008? A number of Nevada pool builders had to close up shop. But not Blue Haven. Our office persevered, and through savvy management, we maintained continuous operation. The ability to survive that storm makes Blue Haven an even stronger entity today. Along with our top-notch reputation for swimming pool construction, another calling card to our success is our long history of holding an A+ rating from the Las Vegas BBB and partnership with major home builders such as Lennar. 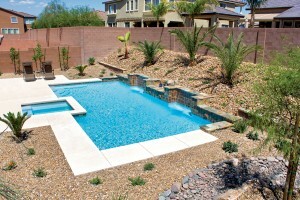 Our staff of highly skilled pool designers can create a custom plan to fit your needs, budget, and style preferences. We use gunite to build pools, spas, and complete remodels and modernizations. We will review with you—in great detail—all the options and pricing possibilities for your inground pool. 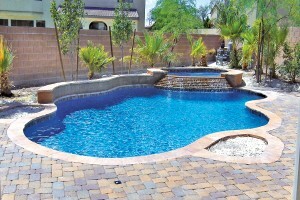 You’ve probably noticed a wide variety of pool shapes and styles here in the North Las Vegas area. Among the most popular choices are natural, free-flowing configurations with faux or natural rocks that use the desert landscape as a palette. We have built thousands of pools like these, and we can create one for your backyard as well. Our warm, dry climate typically allows pools to remain open from January to December. For winter months and chilly desert nights, though, we provide features that will keep the temperature around your pool and patio areas more comfortable. Consider a fire bowl or a custom-built fire pit around the deck area (fueled by natural gas or wood). Backyard living in Las Vegas: We deliver value! Blue Haven clients get to take advantage of special benefits: Our pools make it more convenient to own and maintain a North Las Vegas inground pool. Along with pools & spas that are pleasing to the eyes, they are also pleasing to your wallet. The reason: They feature our exclusive, high-tech equipment that automates pool care, cuts back on chemical needs, and decreases water and energy use. They reduce maintenance costs and enhance swimmer comfort. Naturally high calcium levels in local water can damage and reduce the beauty of traditional plaster surfaces. Our SmartBrite® color quartz finish is a higher-end, stylish, longer-lasting option. Filter maintenance is quicker and simpler with our high-capacity cartridge filters. Better yet, you won’t be wasting hundreds of gallons of precious water washing them out like you would with a Diatomaceous earth (DE) or sand filter. Along with its appealing aesthetics, Sundek® concrete is stain-resistant, and is available in a wide selection of colors, styles, and patterns. Designed for high-temperature summer use, Sundek® is slip-resistant and comes with a special coating that stays cooler for bare feet. Blue Haven has an amazing track record when it comes to helping our North Las Vegas clients obtain competitive loans for financing pools & spas. Even during the Recession, when credit dried up and obtaining home improvement loans were extraordinarily difficult to find in Nevada, Blue Haven had the financial wherewithal and banking-industry savvy to secure pool financing for its customers. Today, we continue to offer pool financing. Our customers can tap into an unrivaled network of pool financing programs, including secured and unsecured loans. Contact us to schedule an in-home appointment for your new inground pool. We are always happy to take the time to explain pricing and options in the comfort of your own home.